The BKL-257H is an economical mount for 1" scope tubes. 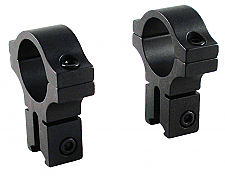 It was designed for the shooter who wants stability and prefers 2 piece independent rings. The 275H is .2" taller than standard Model 257. Bottom of mount to bottom of scope tube: 0.974"
BKL offers the 263 2 piece scope mount in 2 configurations. Choose between the medium or high version. The mounts all solidly fasten onto the dovetail or scope rail. These mounts, like all BKL mounts are sturdy and strong. Once tightened onto a dovetail or scope rail, they simply don't move. 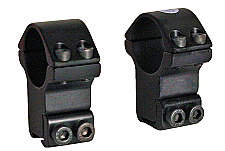 BKL offers the 263 2 piece scope mount in 2 configurations. Choose between the fixed medium or high version. The mounts all solidly fasten onto the dovetail or scope rail. These mounts, like all BKL mounts are sturdy and strong. Once tightened onto a dovetail or scope rail, they simply don't move. These Beeman mounts are designed to be used with all scopes that have a one inch body tube and an objective up to 56 mm. These mounts are great with airguns as they have an integral recoil pin (used to prevent scope creep) built into the base of one of the mounts, but this can be pulled out with pliers for those who do not need to use this feature. The four screws on the split rings and two clamping screws on the side give a secure grip when used on guns with even the most punishing recoil. 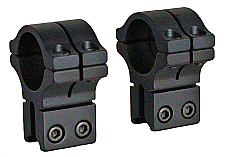 These mounts are designed to be used with all scopes that have a one inch body tube and an objective up to 45 mm. These mounts are great with airguns as they have an integral recoil pin (used to prevent scope creep) built into the base of one of the mounts, but this can be pulled out with pliers for those who do not need to use this feature. The four screws on the split rings and two clamping screws on the side give a secure grip when used on guns with even the most punishing recoil. Made exclusively for Beeman by British SportsMatch in the UK.